Americans deserve a choice between a foreign commodity and a renewable, homegrown fuel. “Why are we putting up with 300 to 400 billion dollars a year going out of the American economy spending money on petroleum, when we can produce that fuel right here?” Growth Energy Co-Chair Gen. Wesley K. Clark (Ret.) poses an interesting question. “The biggest challenge facing the ethanol industry is not producing ethanol, the biggest challenge we have facing the ethanol industry–is access to the marketplace,” says Tom Buis, CEO of Growth Energy. 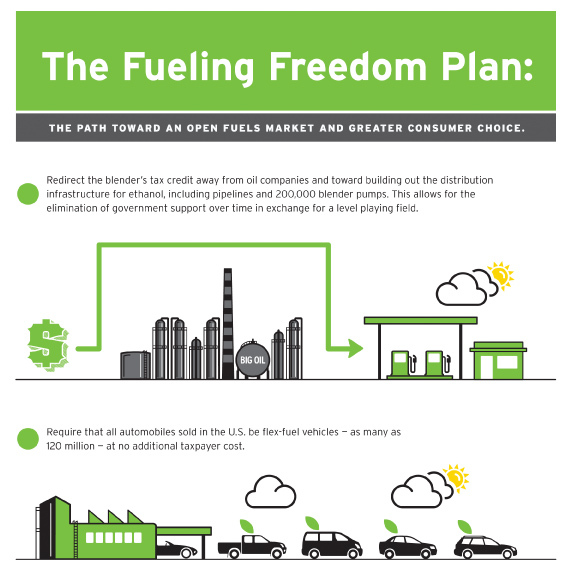 In order to create an open fuel marketplace, the “Fueling Freedom Plan” calls for modernizing the current tax credits that are being paid to the oil industry as an incentive for blending ethanol and redirecting them. “The blenders tax credit, the Volumetric Ethanol Excise Tax Credit (VEETC), served its purpose in the past. It helped build out a blending infrastructure, which is now fully operational. In the old days it spurred production, but we don’t have a production problem anymore,” explains Buis. The plan proposes the phasing out of current ethanol supports over time. It will move over a portion of those funds to build out the infrastructure for the distribution and use of ethanol–shifting the remaining portion away from the oil companies to opening the market. “We are in an industry where basically, we have to count on our competition to distribute our product,” Buis says. • Funds currently going to the oil industry as an incentive for blending ethanol into gasoline (the VEETC) would be redirected to provide backing for the build out of distribution infrastructure for ethanol – such as tax credits for retailers to install 200,000 blender pumps and federal backing of ethanol pipelines. • Requiring that all automobiles sold in the U.S. be flex fuel vehicles – as many as 120 million. This requires no additional cost to taxpayers and a minimal cost (about $120 per vehicle) to vehicle manufacturers. The combination of the two means that over time, all cars can burn whatever blend of gasoline and ethanol they choose. It puts the power in the hands of the consumer, they can choose based upon price or preference. The blender pumps nationwide will allow that consumer to make a choice from up to five different blends. With a limited number of E85 fueling stations – only 2,400 nationwide – and even less blender pumps, the ethanol industry is very limited in market access. To put it in perspective, there are approximately 166,000 retail stations with over 650,000 pumps. The industry has their work cut out for them. “Nothing happens without making the effort and for us to sit back and to not try to do something like this…that would be the biggest mistake this industry ever made,” Buis adds. The ethanol industry also faces the demands for ethanol put in place by the RFS2. “In order to reach the 36 billion gallons that is needed for RSF2, it would take a blend of E27,” says Broin. That estimate is based on the equivalent to today’s gasoline usage. Growth Energy expects the plan to take approximately five years to take effect. Length of time to implement will depend on how aggressive the government program would be on providing incentives to build out the infrastructure. Currently the ethanol industry is facing a “blend wall”–the amount of ethanol that federal regulations allow to be blended with gasoline. Capped at ten percent and set in 1978, the regulation is severely outdated. “With increases in yield and waste cellulose–a billion tons of waste cellulose in this country–there is enough raw material that it is the one fuel that has the potential to replace gasoline in the next twenty years,” Broin says. Ethanol has the ability to create new wealth from products such as cellulose that can create additional revenue streams for this country. With benefits such as driving our economy, creating jobs, cleaning up the environment and the obvious decrease of our reliance on foreign oil from countries that are hostile to the U.S. makes it a no brainer. General Wesley Clark testified before the Senate Agricultural Committee on July 21, 2010 stating, “I think we have to take urgent action on this issue of energy independence. The truth is, we are not going to solve it with a hydrogen economy in the near term. As much as I love electric automobiles, wind and solar, we’re not going to get there with electric automobiles. There are 250 million automobiles on the road. And almost none of them are electric today. Plus, Americans can’t afford to rush out and buy electric automobiles in a year or two, even if they were available, which they are not. In 2009 alone, the production and use of 10.6 billion gallons of ethanol eliminated the need to import at least 364 million barrels of oil, reduced CO2-equivalent greenhouse gas emissions by approximately 16.5 million tons and supported more than 400,000 jobs here in the U.S.
Then there’s the example of Brazil. General Clark points out that, “Ethanol and the American agriculture community is, and I hate to say this, but we’re the victim of a very elaborate publicity campaign to restrict our share of the market. And there is no use hiding from it, running away from it, it is just a fact. There are people who don’t want the expansion of biofuels. They were taken aback by the explosion of production of ethanol in 2003 to 2008. They realize this is serious, this is real. With this plan, Broin, Buis and General Clark believe that the 300 billion dollars that is being sent abroad can be kept in this country if ethanol is given the chance to get in the game. “We’ve got billions of dollars of investment money standing by; ready to come into this market,” General Clark adds. “All they need is the assurance from the government that when we build new ethanol production facilities and build the pipelines and put in the blender pumps that we will be allowed to sell it. In August, Sens. Tom Harkin, D-Iowa, and Richard Lugar, R-Ind., offered an amendment that would mandate the production of flex-fuel vehicles and require the installation of blender pumps—both provisions included in the Fueling Freedom Plan. Growth Energy supports their amendment and are working to get it adopted in energy legislation when Congress. In addition, Broin suggests you can show your support of the plan by joining Growth Force at growthforce.org. “You can learn more about what’s going on and help us to get the word out. Ask for ethanol at the pump. Ask for it to be available and let your local fuel retailer know that blender pumps are an option. Speak to your congressman that ethanol is the fuel of the future,” Broin encourages. When Growth Energy introduced the plan that essentially grants Americans the right they are given with every other purchase, they met hesitation and conflict. A change to the status quo is never an easy one to make, but Growth Energy is up to the challenge. It’s a change that makes sense, and one that America needs.